Colors: All colors and patterns acceptable. There are two distinct varieties of this unusual dog: one is hairless except for its feet, head and tail, and called, not surprisingly, the Hairless; the other is called the Powder Puff. It has a coat of long soft hair. Both come in numerous colors, either solid, mixed or spotted all over. It has a broad skull and a long muzzle. Eyes are dark, and ears are erect. Strangely the two types often come in the same litter. The crested enjoys a romp outside, but it hates the cold. It is small enough that it can get sufficient exercise with vigorous inside games. Hairless varieties will need a sweater for cold-weather outings. This is not a breed for outdoor living. 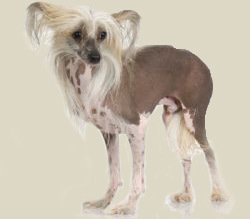 Chinese crested dogs are gifted jumpers and some climb. Coat care for the powder-puff variety entails brushing every day or two. The muzzle is usually shaved every two weeks in puffs. The hairless needs regular skin care, such as the application of moisturizer or sunblock, and bathing to combat blackheads. Most hairless need some stray hairs removed prior to showing.